About three weeks ago, I put up a post on that annoying phrase so often used by the media: “talk about.” Having broken down its prevalence using metrics on the percentage of interviews and questions that contain Talk About’s, I got some positive feedback on Twitter, including a shout-out from Grantland’s Bryan Curtis (thanks!). More than that though, I got some suggestions, including one found in that link right there. Sure, Talk About is a common phrase in sports pressers that gets on everyone’s nerves, but it’s certainly not the only one, right? Another generic interview phrase is the “How _ were you…?” So, I scraped some more information from the same 29,797 interviews (with almost 400,000 questions) between 2007 and 2014 from my last post and found…well, not that much. Compared to the 37,000 or so instances of Talk About, there were only several hundred occurrences of How Blank Were You. Sure, the numbers aren’t overwhelming, like those of Talk About, but keep in mind that when searching for Talk About’s, many more qualifiers can count (“talk more about,” “mind talking about,” etc.). Not to mention, it still is pretty remarkable that the question “how surprised were you” was as common as it was. The fact that it was asked (at least) 103 times means that reporters had already made up their minds that a coach or player was surprised by something in particular and felt the need to find out the extent of their surprise. Similarly, these type of questions are quite frustrating for the very reason that reporters essentially already know (or think they know) what the player or coach has just gone through (or is preparing for) and still feel the need to find out to what degree their interviewees are experiencing this emotion. Maybe, they could just ask, “Were you _…?” and thus not come off as know-it-all’s or as people who read the situation incorrectly if the answer to “How _ were you?” is “not at all”. Fortunately, interviewers do ask the “Were you” question considerably more often than the “How _ were you” with over 4,000 (more than 1%) of question blocks containing the former question at least once compared to the paltry few hundred question blocks containing the latter. Although the percentages are still low compared to Talk About, they aren’t negligible. Again, football and basketball interviews and press conferences are “big” culprits, and the tennis media apparently cares about switching up their question syntax. 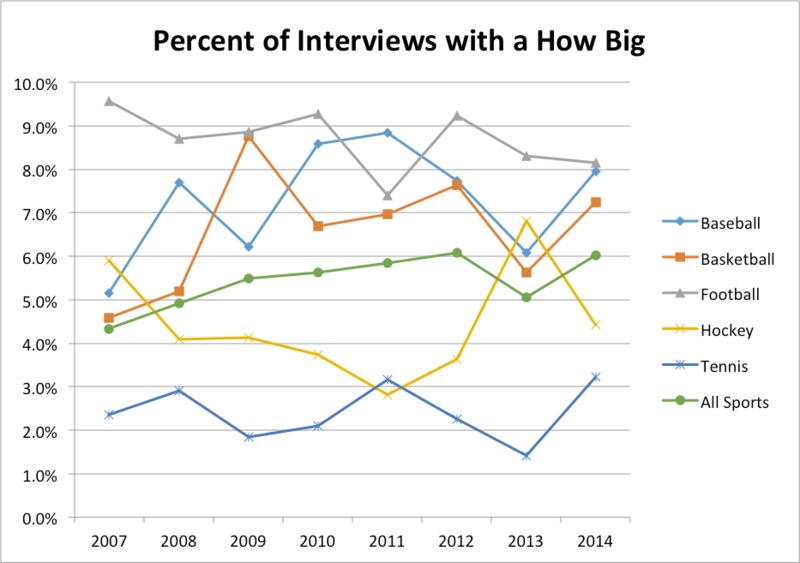 But, unlike Talk About’s, there is a clear and present growing trend of the “how big” phrase. Simply adding a best fit line to the “All Sports” data points in the graph above reveals a gradual upward slope with an R2 of about 0.5, so definitely non-trivial. Whereas Talk About has been around for a while and, maybe (hopefully) is stagnating, How Big is getting and could get…bigger. So far, all of this analysis has focused on the questions asked in sports pressers. Recently, I had the opportunity to scrape more of the text itself and dissect the answers a bit as well. There is still more to be investigated here, but one thing I found intriguing was the difference among the surveyed sports with respect to athletes and coaches’ use of the words “I” and “we”. 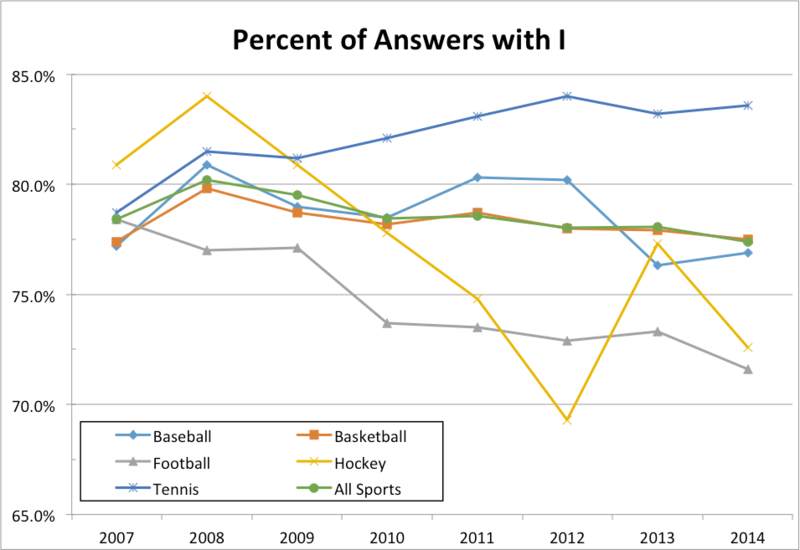 Below, the two graphs of percent of answers that use each of these words (signals of self-centered and team-based attitudes) clearly show that each sport actually has higher frequency of “I” than “We”. More than just observing that “I” is used more frequently than “We” (athletes and coaches apparently are asked about themselves as much or think about themselves as much as the team), we can break down the sports. 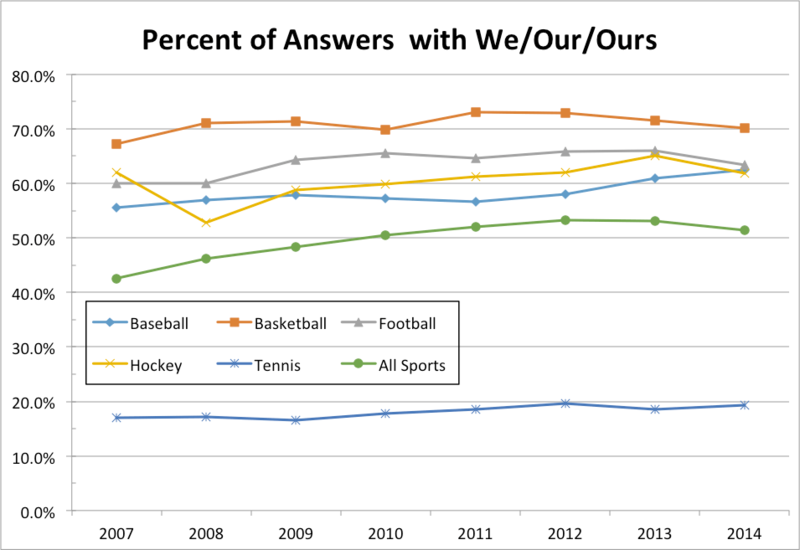 Tennis (obviously a much more individual sport) displays a steadily increasing % of answers that contain “I” (upwards of 80%) compared to the “We” percentage that is less than 20% for the sport. On the other hand, team sports, particularly football and hockey have seen recent constant decline in the “I” percentage (such that they are the two lowest in the category) and increasing “We” percentages. 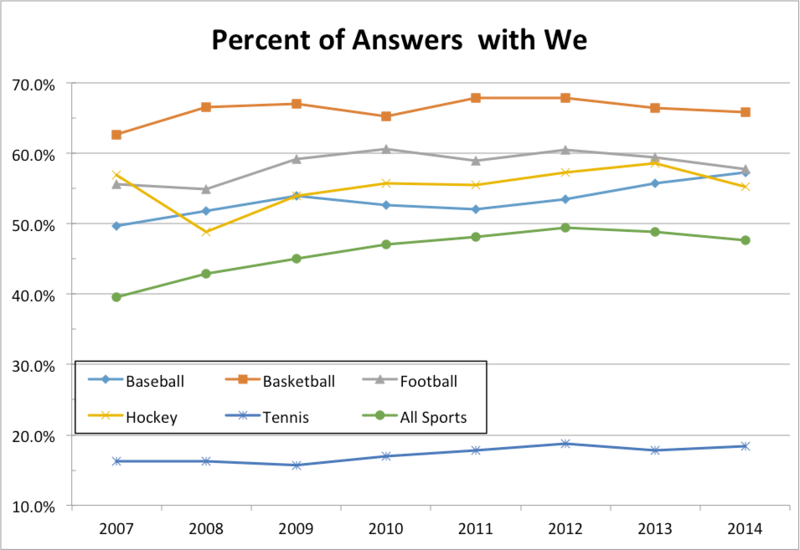 In fact, all 4 of the team sports, in the sample of almost 400,000 answers to interview/press conference questions, exhibit an increasing proportion in the number of answers that contain the word “we”. Here, however, football and hockey are no longer leading the way in unselfishness: they are roughly tied with baseball for a “We” percentage of 50-60%, trailing the selfless athletes and coaches of basketball, who use “we” in nearly 2/3 of all answers. 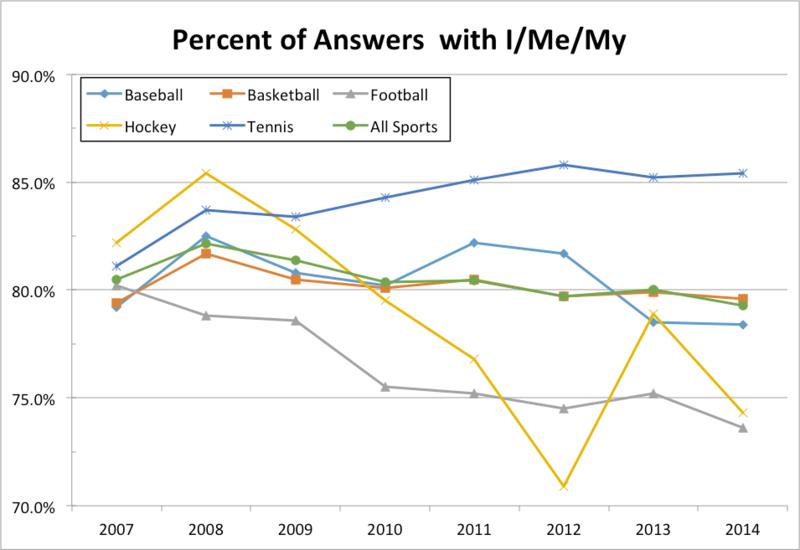 For those interested, I also searched the data for answers that used “me” and “my” and tacked that on to the “I” category and similarly appended “ours” and “our” to the “We” percentage in order to generate the two additional graphs below, which reveal the same overall and sport-by-sport trends with, as we would expect, slightly higher percentages (given the added word variety).